Such as: If I were you I wouldn't go out tonight, you might meet up with a accident <cough>. A week ago I called a tow to take my car to a local garage; turn the key ... no juice; I suspect a short. Just picked it up ... total cost with tow about $210.00 I pay for everything in cash ... no big whoop. Waiting for them to bring my car out and I notice a sign in the office. "We no longer accept personal checks". Probably won't change for a while. The're probably waiting for the check to clear. I think it's been a nice day here, or at least it's sunny right now. But I got caught up in planning a trip around Munich, location of pubs, how the S- & U-bahn work etc etc. Make sure you get to the market - for food lovers. mmmmmm, scrummy. You can guarantee I'll be making a beeline for that. The Viktualienmarkt is a kind of farmer's market with open air stalls packed closely with enclosed kiosks. Imagine one of them - 50 sq m devoted only to cheese. In the heart of the Viktualienmarkt, you find a beer garden; shaded by hundred-year old chestnut trees, this is a wonderful place to take a break from shopping and to watch the bustling market scene around you. The beer garden, which sits 1000 people, offers hearty Bavarian specialties; try a pork roast with sauerkraut and dumplings, warm potatoes salad, or a "Brotzeit" platter with cold cuts and homemade artisan cheese. You can also bring your own food. So, an intimate little spot for a quiet stein then? Sitting minding other peoples business on the Gerrards Cross to London train this morning - I happily read the briefing document of the Treasury man sitting beside me of rise in unemployment anticipated from upcoming Economic Review. 468,000 government jobs are going to go by 2014/15 and 112,000 London jobs will go (3% of total jobs). The "narrative" of the cutting is to try to blame Labour and not to allow any linkage with Thatcher cuts. The US economy is frequently compared to Japan in the early days of its lost decade, but here's one way it's way different: the US is a much worse place to be a worker. As this chart from Deutsche Bank nicely illustrates, US unemployment took off like a rocket when the crisis hit. 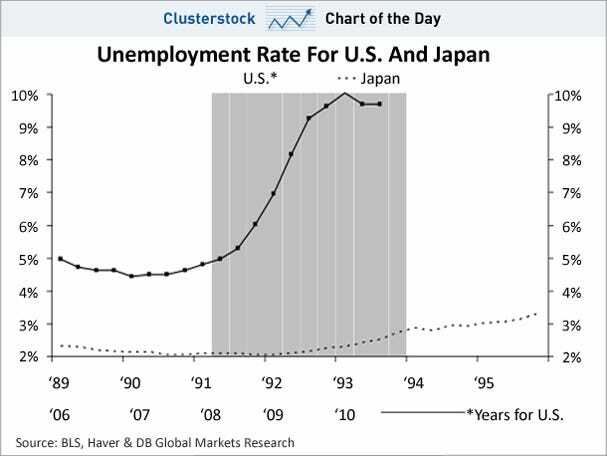 In Japan, it barely budged, just gradually getting slightly worse over the years. There must be a mechanical reason for this. Pay on Wall Street is on pace to break a record high for a second consecutive year, according to a study conducted by The Wall Street Journal. About three dozen of the top publicly held securities and investment-services firms--which include banks, investment banks, hedge funds, money-management firms and securities exchanges--are set to pay $144 billion in compensation and benefits this year, a 4% increase from the $139 billion paid out in 2009, according to the survey. Compensation was expected to rise at 26 of the 35 firms. The data showed that revenue was expected to rise at 29 of the 35 firms surveyed, but at a slower pace than pay. Wall Street revenue is expected to rise 3%, to $448 billion from $433 billion, despite a slowdown in some high-profile activities like stock and bond trading. Overall, Wall Street is expected to pay 32.1% of its revenue to employees, the same as last year, but below the 36% in 2007. Profits, which were depressed by losses in the past two years, have bounced back from the 2008 crisis. But the estimated 2010 profit of $61.3 billion for the firms surveyed still falls about 20% short from the record $82 billion in 2006. Over that same period, compensation across the firms in the survey increased 23%. I question the timing of this news by the WSJ. According to the NYT, Reuters is disputing the numbers in the article. I doubt that Wall St even imagines there is a problem with this behaviour. I agree, but I think the timing of the article is designed to stir up anti-incumbent feelings of American voters. The cattle will get what they deserve. President Reagan once famously quipped that everyone who is supports abortion has already been born. In the same vein, it is worth noting that all the policymakers who don't think we should worry about 9.6% unemployment have jobs. This simple fact cannot be repeated enough times because it explains a huge amount about current economic policy. For the tens of millions of people who are unemployed, underemployed or have given up looking for work altogether, we are in a crisis. The economy is an absolute disaster, ruining their lives and also jeopardising the futures of their children and grandchildren. The Senate is basically an oligarchic institution, so it's no huge surprise that many senators gave more weight to the interests of fossil-fuel industries than they did to the public interest in mitigating climate change and developing clean energy. Oil and gas groups outspent green groups 7 to 1 -- and that doesn't count Big Coal money. Exxon alone outspent all green groups together. The top ask of Senator Debbie Stabenow, of Michigan, was to insure that incentives given to farmers for emissions-reducing projects--known as "offsets"--would be decided in part by the U.S.D.A., and not just the E.P.A. "Ultimately, farmers aren't crazy about letting hippies tell them how to make money," [Lieberman aide Danielle] Rosengarten said. Stabenow will help save the world as long as they don't let hippies tell farmers what to do. That just violates the natural order of things! Farmers don't get regulations, they get subsidies. Oh, and veto power over the nation's energy policy. Needs reading, that post. Along with another from Grist that I put in the Salon. They are now in jail.